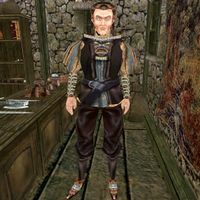 Heifnir is a Nord trader who runs a shop in Dagon Fel, where he deals in a wide variety of general goods. He is wearing common pants, an expensive shirt with matching shoes and wields a steel warhammer. Aside from his natural resistance to shock, immunity to frost, ability to shield himself, and a natural frost damage spell, he knows the following spells: Both Almsivi and Divine Intervention, Soultrap, Telekinesis, and Almalexia's Grace.